By the time Friday morning rolled around, the last precast concrete beam had been hoisted into place atop the new parking structure taking shape in downtown Missoula. Crews then hoisted an American flag, unfurled the Iron Workers Local 14 banner, and set a small evergreen tree atop the structure. At some point in the future, the tree will be planted on location. For Lou LaVe, owner of Precision Precast Erectors, the topping out ceremony represents another job safely completed. 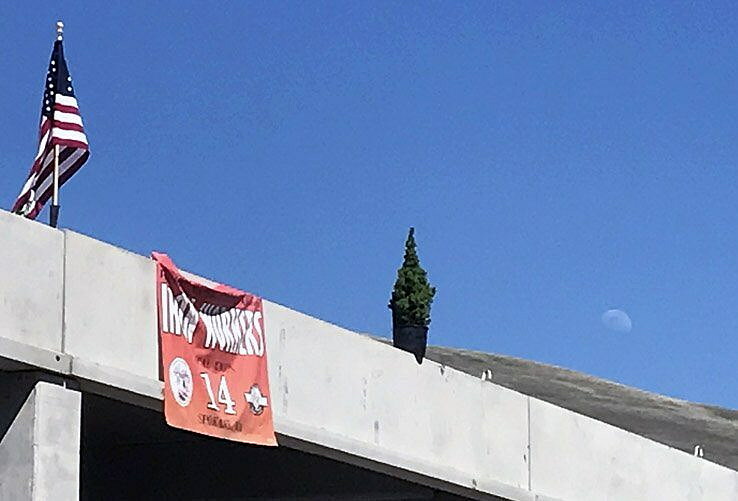 The practice of topping out, which takes place when the last piece of material is set into place, traces back to the ancient Scandinavian rite of placing a tree atop a new structure to appease those spirits displaced by construction. LaVe has practiced the ceremony for the 40-plus years he’s been in the construction trade, though he believes the ceremony arrived in the U.S. a century ago. The parking structure, built by Precision Precast Erectors, marks the first phase of a new student housing project unfolding on Front Street in downtown Missoula. The concrete garage containing two levels will offer 308 parking stalls, part of which will be managed as public parking by the Missoula Parking Commission. Atop the structure will stand four floors of student housing offering 488 beds. The project, launched Farran Realty Partners of Missoula, is slated for completion this time next year. For LaVe, the downtown project is something of a coming home. He graduated from the University of Montana in 1974 as a forestry technician and applied for several jobs with the Forest Service, along with Weyerhaeuser. Back then, the pay amounted to around $13,000 a year. It wasn’t bad for the early 1970s, though LaVe wanted to earn more. He asked his uncle, an iron worker, to get him in the trade. He made $25,000 his first year as an apprentice in the industry. Aided with his skills from UM’s forestry program – transits, yodalights and levels – he then moved up the industry ladder. Precision Precast Erectors is a member of the Precast Concrete Institute. The company bids on national projects, including football stadiums, basketball arenas, prisons, parking garages and data centers. The workers on the Missoula job are local, LaVe said. LaVe expects his crew to be on the Front Street site for another two weeks before moving across Missoula to West Broadway, where they’ll begin work on the parking structure at Stockman Bank.